Stops the Player from re-calculating pathfinding calculations. Stops the character from moving along the current Paths object. Prepares and updates the sprite child in one go. This is necessary for player characters when starting a scene, to ensure they appear correctly to begin with. Clears the current Expression so that the default portrait icon is used. Gets the active portrait that's displayed in a MenuGraphic element when the character speaks. The portrait can change if an Expression has been defined. Assigns or sets the FirstPersonCamera Transform. This is done automatically in regular First Person mode, but must be set manually if using a custom controller, eg. Ultimate FPS. 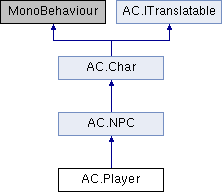 Attaching this component to a GameObject and tagging it "Player" will make it an Adventure Creator Player. The character's "FixedUpdate" function, called by StateHandler. The Player's "Update" function, called by StateHandler. Checks if the character can be controlled directly at this time. Gets the angle by which the Player's FirstPersonCamera is looking up or down, with negative values looking upward. Gets the rate at which the character is turning (negative values used when turning anti-clockwise). Checks if the Player is constrained to move along a Paths object during gameplay. Checks if the Player's FirstPersonCamera is looking up or down. Causes the Player to jump, so long as a Rigidbody component is attached. Updates its own variables from a PlayerData class. Updates a PlayerData class with its own variables that need saving. Sets the enabled state of Player's ability to head-turn towards Hotspots. Locks the Player to a Paths object during gameplay, if using Direct movement. This allows the designer to constrain the Player's movement to a Path, even though they can move freely along it. Sets the tilt of a first-person camera. Makes the Player spot-turn left during gameplay. This needs to be called every frame of the turn. intensity The relative speed of the turn. Set this to the value of the input axis for smooth movement. Makes the Player spot-turn right during gameplay. This needs to be called every frame of the turn.